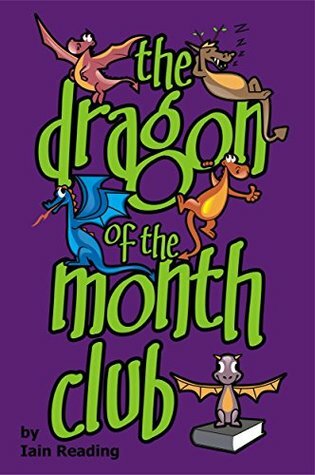 Ayana and Tyler find a magical book that teaches them a new dragon-summoning spell every month. When one of their spells goes wrong, they are whisked into a magic land that manifests from different books and furniture in Tyler’s bedroom. They conjure several dragons to help them in their adventures, until they have a little entourage of creatures following them. Travelling across the wilderness, crossing oceans, and encountering strange characters from Tyler’s books, the two friends struggle to reach the tower of Professor Mobius, who they hope has the ability to send them back to the real world. I enjoyed this book so much! The plot is really imaginative and interesting. The writing and pacing are excellent, keeping the reader on their toes with lots of plot twists and surprises. Every setting is so varied and different, because the characters move from one book world to another, visiting the settings of a fairy tale forest, a Chinese garden, the sandy deserts of Dune, the London of Sherlock Holmes, and every jungle, mountain, and ocean in between! Tyler and Ayana have wonderful character depth and development. They each have a lot of emotion rolling around inside them, and I love how they protect and support each other. Their friendship is one of the best things about this book! My only complaint about Tyler and Ayana’s friendship is the beginning of their friendship. It’s very insta-friends (as opposed to insta-love), and the scene where they meet is quite short. They say, “Hello, I’m Ayana. Hi, I’m Tyler. Nice to meet you.” BOOM! They’re best friends. I needed a little more conversation, a little more build-up there. Why couldn’t they talk about something they have in common? They meet in a library, so why not have a little conversation about books? At least then, I would have some groundwork for their friendship, and a reason why I should believe that these two are suddenly hanging out and doing homework together and meeting up after school and all that best friend stuff. I felt really disappointed that I didn’t get to see the beginning of their friendship, getting to know each other, realizing they have something in common, and BECOMING friends. It left a big hole in the story that could have easily been filled with just a few paragraphs. Still… the rest of their friendship is delightful! I worry that some of the book world settings are a bit too specific in their details of characters and plots, and will spoil anyone who hasn’t read those books. I haven’t read Dune yet, so I don’t know if I got spoiled for anything; but there are definite spoilers for Sherlock Holmes, especially the “Red-Headed League”. If you haven’t read Sherlock Holmes, then don’t read this one yet! I wish the author had created more generic book worlds without so many spoilery details. This book ends on a major cliffhanger, which has me itching to get my hands on the next book! All in all, I really enjoyed this book, and look forward to reading more in this series! Dragons, books, and adventure… what more could you ask for?! Disclaimer: I received a copy of this book from the author/publisher in exchange for a free and honest review. All the opinions stated here are my own true thoughts, and are not influenced by anyone.